"When the best part of a family dies, everyone falls apart." 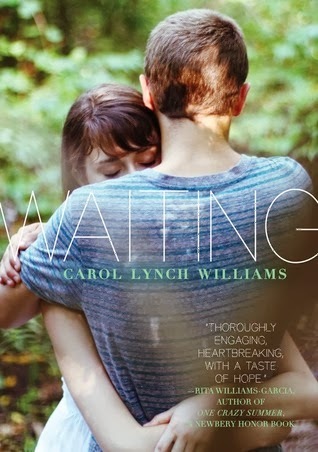 Carol Lynch Williams' Waiting proves this phrase in many different ways. After the death of her brother Zach, London struggles to continue with daily life, especially since her father has become distant and her mother actively ignores her. Haunted by his death and barely able to speak, London searches for normalcy and a way to keep living. It's been awhile since I read a novel in verse; I've missed them. I love reading between the lines and how authors move the plot along with fewer words. This is the second book I've read by Williams; The Chosen Ones was equally intense and disturbing. It seems that Williams' novels include religious confusion, parents that don't do what they should, and girls who have to hide their sexual awakenings. I'm still trying to get my hands on Glimpse, the novel which originally interested me in her writing. I have a hard time justifying buying novels in verse because I read them so quickly. While reading, I was reminded of John Green's Looking for Alaska. Both books build towards a tragedy and keep you turning the pages, wanting to know what the big event is. Once you know, you hope that the characters can rebuild their lives. London will receive no help from her mother, who is one of the coldest I have ever encountered. Her actions are so unacceptable and she has no redeeming qualities to the point that she is unrealistic. How could any mother act this way? Waiting is too dark for my sixth grade library but high school readers with a taste for sadness will enjoy this book. I've gotten this book from the library at least 4 times and I always return it without reading. I'm glad to hear you enjoyed it =) William's books are always pretty dark, I found Glimpse to be especially upsetting.